I made this a few years ago to send to my mother-in-law in another country. We don’t speak the same language, so I wanted to show her respect and love. 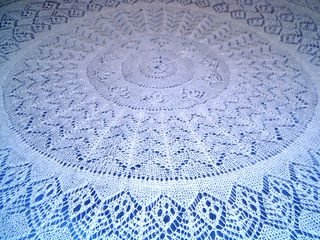 She works with her hands and makes lovely things, too, so I hoped she would like it. She said she did! My husband said she took it out and showed people who visited while he was there. 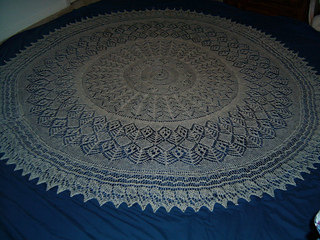 It took me more than a year, and it got bigger and bigger, and I had to order extra yarn twice, LOL. 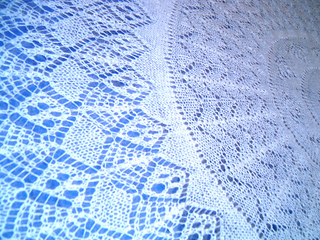 When I was blocking it, I found a split in the yarn, and freaked out. In a panic, I called Schoolhouse Press and actually got Meg Swansen on the phone!!! I think she thought I was calling to complain about the yarn, but I really just wanted help fixing the problem! She was very kind and advised me to either tie a knot or try a spit splice. I had used spit splices to connect the yarn throughout, but chose a knot to fix the break, since it was in the middle of an open section and I didn’t want to have to pull enough through to do a spit splice. It was a great joy to do this!